One Minute Tips - Retiring as a Couple? Roughly half of marriages in both the UK and the US end in divorce, but, whilst divorce rates are falling or plateauing in other age groups, later-life (or silver) divorce is on the rise. Most people understand the risks that marriage brings, but no one gets married with the expectation of dealing with divorce. According to AARP, women initiate about 60% of US divorces after age 40, However, even if you were the person who instigated it, divorce ranks as one of the most stressful situations anyone can go through. Dealing with a divorce and its aftermath is no small matter. It requires patience and stamina. There are no shortcuts. That doesn’t mean that the process of getting over a divorce will take years. How long it takes is largely up to you. There is life after divorce. Give yourself time before dating again. How much time you require is an individual decision. But there’s no rush. When you begin dating before you’re ready, not only are you potentially creating additional challenges for yourself, but consider your dates, too! They might be getting more than they bargained for. Take the time you need to heal. Take the opportunity to make over your life. Now might be the perfect time to join a gym, start a new hobby, or travel. When you’re married, you have to accommodate the needs and wishes of another person. You can give yourself more consideration for a change. Learn from your divorce. What went wrong? What did you learn? What were the good and bad qualities of your partner? What type of person do you believe would be the best match for you? What mistakes did you make along the way? A divorce is painful, but a great learning opportunity. You can have much more confidence in your next relationship if you use what you learn. Forgive. You can’t truly move on until you’ve forgiven your ex-spouse. This may take time. But you’re never really free until you’re able to forgive. Get the support you need. This might take the form of a friend or family member. There are also support groups for the newly divorced. Avoid the mistake of attempting to navigate your healing process alone. Maintain your daily routines. This means to continue to bathe, brush your teeth, and so on each day. Continue to eat healthy meals. Go to bed at your normal time. Keep your normal social outings. 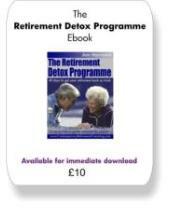 It’s easy to fall into a slump and to allow the quality of your life to deteriorate. Some things will change, but many things can stay the same. Avoid making your situation worse. This isn’t the time to overeat, drink excessively, or start using drugs. A rebound relationship also isn’t advised. Get your feet back on the ground and avoid doing anything that can make your challenging circumstances ever harder. Get out of the house. Not only can you keep your previous social schedule, you can consider adding to it. Join a yoga class or a golf league. Create something new that you can enjoy with others. You won’t find any solutions while you’re sitting on the couch, staring out the window. Share your feelings with a divorced friend. It’s important to talk to someone who has had the same experience. Confide in someone that has successfully moved on from divorce. If you're female, join us in the Association of Retired Single Women Facebook group. We're a friendly lot - mostly happy to be single and not particularly looking for another relationship (but we haven't completely closed that door to the right person.) Instead, we try to get the most out of our lives - traveling, hobbies, moving to new areas (or new countries! ), some of us are still working and some are starting retirement businesses. Divorce is stressful and unsettling. There are almost 900,000 divorces each year in the United States and over 111,000 in the UK. You’re certainly not alone. Give yourself time to grieve and heal. In time, your life can be even better than it was before. Use this opportunity to reinvent yourself and your life. Everyone has a bad day now and then. You only have two choices: you can either ride it out, or do something to turn the day around. A time machine isn't an option, but there are plenty of tactics you can apply to put your day on a more satisfying path. You might have woken up on the wrong side of the bed, but there's still time to salvage the day and extract some value from it. 1. Take a shower or bath. A hot tub might be even better (if you have access to one). It doesn't matter if the water is hot or cold. Just the sensation of the water on your skin can change your mood and perspective. It will certainly snap you out of any negative thinking. 2. Take a nap. A short nap can give you a chance to start your day over with a fresh attitude. 3. Speak with a friend. You know that friend that can always cheer you up? Give her a call and allow her to work her magic. She's probably dying to hear from you anyway. 4. Eliminate something from your schedule. Determine the least significant thing on your schedule and drop it. Once a day gets started on the wrong foot, accomplishing everything on your to-do list can seem hopeless. Give yourself some hope. 5. Spend time with a pet. You might feel better after watching your fish or hermit crab wander around, but petting a dog or cat might be more effective. 6. Make yourself laugh. Watch a funny movie. Read a few jokes. Make good use of YouTube. 7. Listen to music that makes you feel better. You already know which song always makes you smile. Listen to it. In fact, create a playlist of songs that you can listen to at a moment's notice. Keep them handy. Your cell phone might be the perfect storage location. 8. Get some exercise. Any sort of exercise will do. Go for a run. Lift some weights or play some tennis. Get your blood pumping and your lungs working. As long as you don't overdo it, you're bound to have a more positive perspective on your day. 9. Create a gratitude list. When you're feeling down, there's a good chance you're too focused on the parts of your life you perceive negatively. Put your attention on something positive. Make a list of the good things and remind yourself of how terrific your life is already. 10. Look at some photographs. Pull out your high school yearbook or check out your friends' photos on Facebook. Remind yourself of what you and your siblings looked like 30 years ago. Keep a few photos on your phone that always make you smile. 11. Have some chocolate. Chocolate is an effective way to enhance your mood. Dark chocolate is even good for you! A bad day isn't an excuse to eat your own body weight in chocolate, but a few aquares might be the solution to your bad day. 12. Meditate. Meditation has become a popular stress solution. Many large companies are even adding meditation rooms to the workplace. Regular meditation can greatly uplift your mood and strengthen your focus. Remember that what seems like a bad day might only be a bad minute that has soured your perspective. Bad days can seem to occur at random, but that doesn't mean you have to suffer through it. You can turn your day around. Take a deep breath and make the best of it. You know plenty of tactics to fight back! Robert Waldinger is the Director of the Harvard Study of Adult Development, one of the most comprehensive longitudinal studies in history. 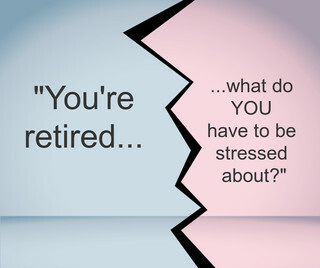 "You're retired... what have YOU got to be stressed about?" Has anyone ever said something like that to you? They don't know the half of it, do they? 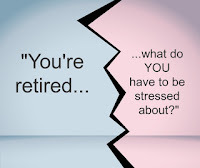 the fact that you're no longer working doesn't mean that the things that cause you stress retired at the same time you did! A really excellent way to start practicing self care every day is to keep a journal. This is something you can easily keep with you no matter where you are, whether you put it in your handbag or pocket, or you have a digital journal on your computer. It's good to have something to write in even when your laptop is out of charge, so keep a journal and pen handy and get writing! With journaling, you're able to write in it whenever you feel stressed or just to mull over what happened each day. It can be very cathartic. If you're busy, busy, busy and always surrounded by people and noise, make sure you have at least a few minutes each day all to yourself. This can be a 30-minute walk that you go on after dinner, a fun 15-minute dance party to your favourite oldies radio station, or just 5 minutes in the morning before everyone else gets up while you enjoy your cup of coffee. It can seem so simple and minimal, but these little stretches of time where you're alone and just doing something for yourself can make all the difference. And if you have a bit too much alone time and not seeing enough people is becoming a problem for you, check out our 10-Step Checklist for Making and Keeping New Friends or, if you live in the UK, visit the DO IT website and punch in your postcode to see all the volunteering opportunities in your area. Sometimes helping your physical health is also important, so don’t forget about exercise. This will make you feel better about yourself and raise your self confidence, which also helps your mental state. Plus, exercise is really good for helping to relieve your stress and the endorphins you get from it can be tremendous for improving your mood. You don’t need to go to the gym for an hour every day either. Something as simple as an afternoon walk or doing a bit of weight lifting in the morning before your shower is perfect. You can also take advantage of other activities that also include exercise, like taking your dog for longer walks or taking the grandkids hiking over the weekend so everybody is exercising more. In addition to exercise, you should also be focusing on proper diet by drinking more water and eating healthier. This is all part of taking better care of yourself. But you know this already! Just stick to it and if you fall off the wagon and have the odd cheat day or two, get back on it a.s.a.p. and don't beat yourself up too much.